After purchasing the plugin, you should receive a purchase receipt via email. This email will contain a link to download a .zip file of the plugin. Save the .zip file onto your computer, then login to WordPress. Then, navigate to Plugins » Add New and click Upload. Click "Choose a File" to open the file browser and select the ask-me-anything.zip file, then press "Install Now". Once installed, activate it, and then you’re all set! 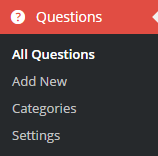 Everything related to Ask Me Anything can be found in the "Questions" menu in the admin panel. To configure the settings, go to Questions > Settings.